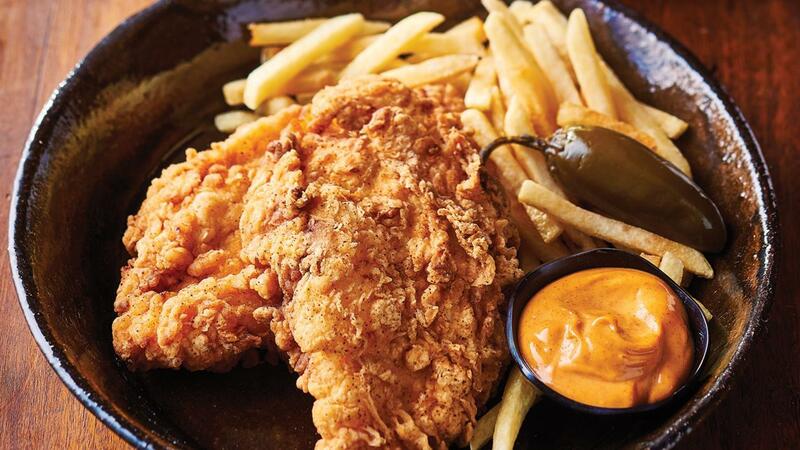 Classic Southern American Fried Chicken meets an Aussie favourite. Buttermilk and spiced coated crispy chicken schnitzels, served with chips and 'Comeback Sauce'. Marinate chicken in buttermilk and salt for three hours refrigerated. In a bowl, combine flour and spices. Drain chicken from buttermilk and place into flour mix, then into whisked egg mixture and back into flour. In a bowl, mix HELLMANN'S Real Mayonnaise and KNORR Mixed Chilli Puree. Serve with chips and Comeback Sauce.